What to Do? Where to Eat? Where to Shop? • Make better use of the educational and support services provided by their universities than do commuter students. Consistent with this perspective and to ensure the quality of the first year experience, HSSU requires all first-year students who live outside a 50 mile radius of the University to reside on-campus. 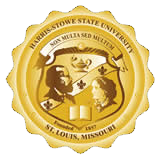 HSSU students who begin in the fall are required to live in campus housing during their first fall and spring semesters. Students who begin in the spring term will need to live on campus during that first spring semester and during the next term the student is enrolled (summer or fall). 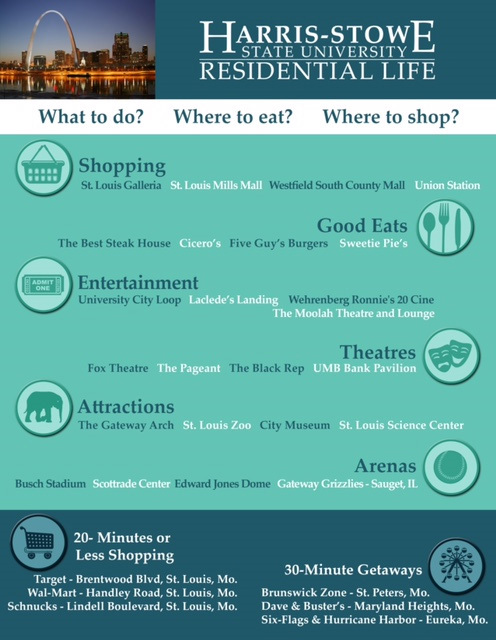 Information on the different housing options available and the prices for each can be found on the Office of Residential Life website or by calling (314) 340-5300.When living in campus housing during the first year, students must also purchase an on-campus meal plan. (This does not apply to those students that elect to reside on campus during their initial summer term). Exemptions for the mandatory first-year campus residency requirement will be considered on a case by case basis. Students who are married, over the age of 21, or single parents may be exempt from this requirement. The University will also consider requests for exemptions based on medical or disability circumstances, as well as cases where significant personal hardship would be incurred. Requests for exemption consideration will be processed through the Vice President of Student Affairs and Enrollment Management's Office.